Zigging and Zagging – Run. Ride. Roam. Man-o-man what a cold morning! In fact it was a cold night and we were tucked up in our beds at 9:30, just so we could get under our quilts and get warm. When I ventured out of the tent first thing this morning, it was into a super cold dawn. I gathered my bits and pieces and walked across the field in my shower thongs, through the heavy and freezing cold dew, which of course gave me freezing cold feet. (Oh, and when I say I was wearing thongs, I’m talking about the footwear that others may call flip-flops or jandles. So by thongs, I’m referring to footwear, not thong underwear, just in case that was in any way lost in translation and conjured up horrifying and scary mental images!!) I mentioned that our campsite was just a field, so in other words, pretty basic and the facilities were equally basic. I was again first into the shower, which was a single shower located in a shed at the far end of the field. Apart from a door for dignity, it was otherwise fairly open to the elements, so I say again, it was cold! The shower cost 75p for 5 minutes of hot water, so I had to stand behind the door of the shower cubicle, get undressed, hop around in the cold, while trying to picture myself in the Sublime hotel steam room, to trick my brain into thinking I was nice and warm and in a very palatial location, rather than a freezing cold shed, surrounded by cobwebs and spiders. I then opened the door, trying to maintain as much dignity as possible, because the box that required the 75p token was outside the shower cubicle. I reached around, inserted my token, closed the door, hopped around in the cold a bit more with my hand under the water waiting for the hot water to start flowing. All the while, I was aware that the precious seconds of my 5 minute allocation were ticking away while I waited for the hot water to arrive. Finally the water went from glacial to warm, so I hopped under and set a new record for soaping, lathering, scrubbing, shampooing and rinsing. I jumped out before my five minutes were up, because I wanted to get out of a hot shower, rather than wait for the water to go cold after five minutes and have to get out feeling even colder. Then it was more jumping around, towelling rapidly, blowing out my cheeks and shivering, while I hurriedly dressed into warm layers in the cramped confines of the little cubicle in the shed. Then it was back across the field, through the cold dew and back to the tent where I made a cuppa and wrapped my bare feet around my tin mug to try and warm them up and get some feeling back into my toes! That was my very chilly start to the day! As the sun came up, things did warm up slightly, so we packed up the tent, which was still soaking wet from the dew and rode off into the cold, but gradually warming, morning. We had quite a bit of road riding today, interspersed with riding along cycle paths beside the road, so it wasn’t quite the quiet and peaceful ride that we had yesterday. We also had some hills, which was good, just to keep the legs and lungs firing as they should. 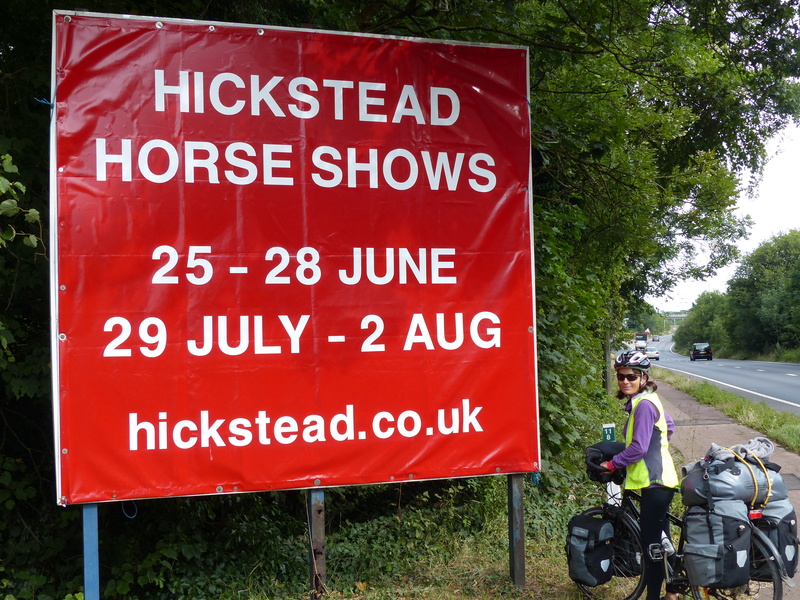 We rode past Hickstead and the International Horse Trials happened to be on. Hickstead is one of those places I used to read about all the time as a child and all the elite riders compete there, including Olympians, so it’s a big and important event. We rode in with the line of cars, to see if we could see anything, but stopped when we got to the Admission board and turned around. Oh well, I got to see the sign! 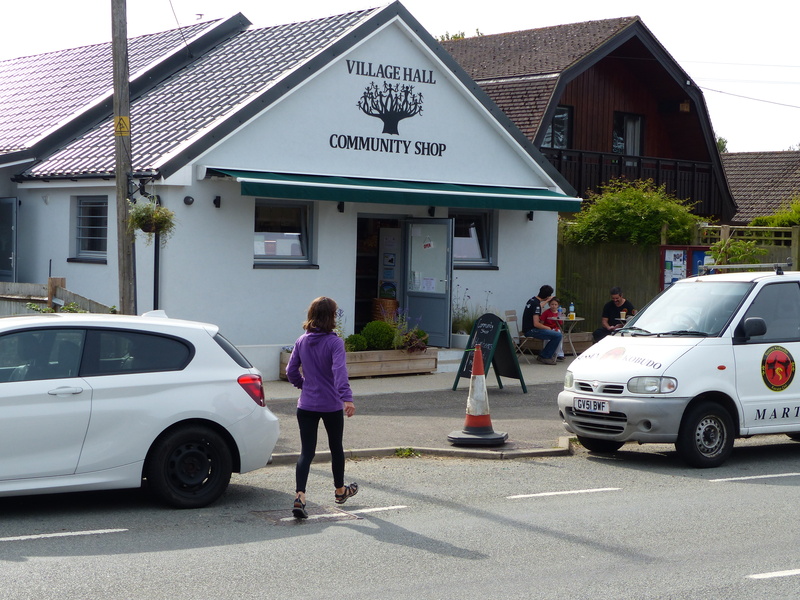 As we left Hickstead, we stopped beside a small village store, run by volunteers, and I found some nice crusty baguettes for elevenses, so we were set for the ride ahead. We rode into the small village of Staplefield, which consisted of a cricket field, half a dozen houses and two pubs. We had some hills ahead of us, we were making good time, having done 30km at 10:30, so we decided to stop for an early elevenses and fuel up for the climb to come. 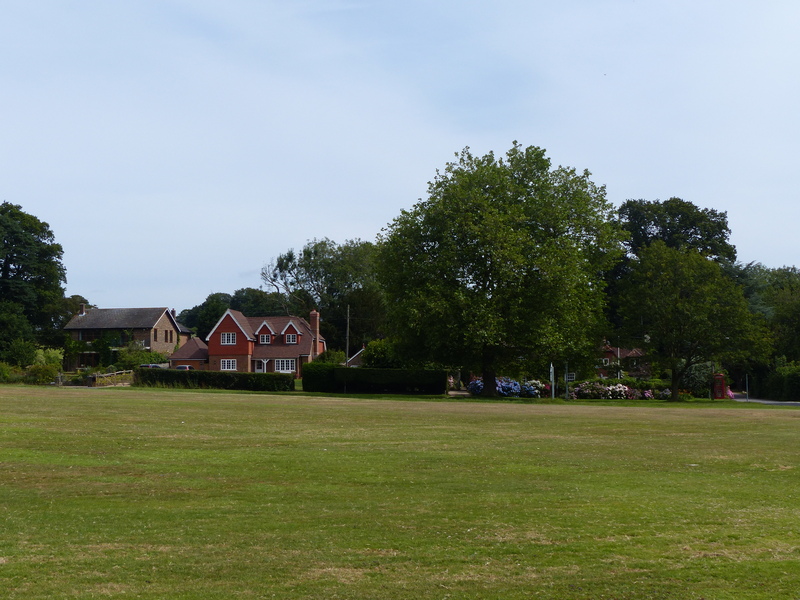 We sat on a bench beside the cricket ground and pondered the history of the area, given that this village was clearly tiny, yet had two pubs, one at either end of the field. I can only guess that it was a popular stage coach stop over and needed to provide refreshments or lodging for passing travellers. It’s still tiny today, yet obviously manages to sustain those two public houses, so I guess the passing trade through the village must still be pretty brisk. On we rode, climbed the hills, which weren’t actually too bad and rode on into Crawley. Crawley was a big town, not far from Gatwick airport, so was busy and bustling. We had now zigged our way from south, down at Small Dole, back up north to now be near Gatwick. We stopped at a cafe with outdoor seating where we could watch the bikes, had a drink and researched the locations of a bike store and outdoor store in town. We then walked the bikes through the busy pedestrian streets, found the bike store and thankfully, Steve was able to purchase two new spare inner tubes for his puncture prone rear wheel. Phew! As I waited outside, I had some enquiries from a couple of different men, about the bikes and the trip, which is always nice, so I had another chat. After finding the inner tubes, we were off to another store to find a new gas bottle for the Trangia and again, I waited on duty with the bikes, while Steve went in to make the purchase. I saw a lady with some familiar Alexander McCall Smith books in hard back and she had stopped in the street and was looking at one, before putting it in her bag. I decided to join the ranks of the locals and take part in the wonderful national pastime of striking up a conversation with a complete stranger. Steve had emerged by this time and had begun walking off, but I approached the lady for a chat. “Excuse me, I couldn’t help noticing the book you had, is that a new one, has he just released a new book?” I asked. And on we went chatting about the books, before I wished her enjoyment in her reading and she bade me farewell. It was a very nice chat and I’m glad I had the chance to join in that fabulous “stranger chat” activity of which I have been on the receiving end so many times. 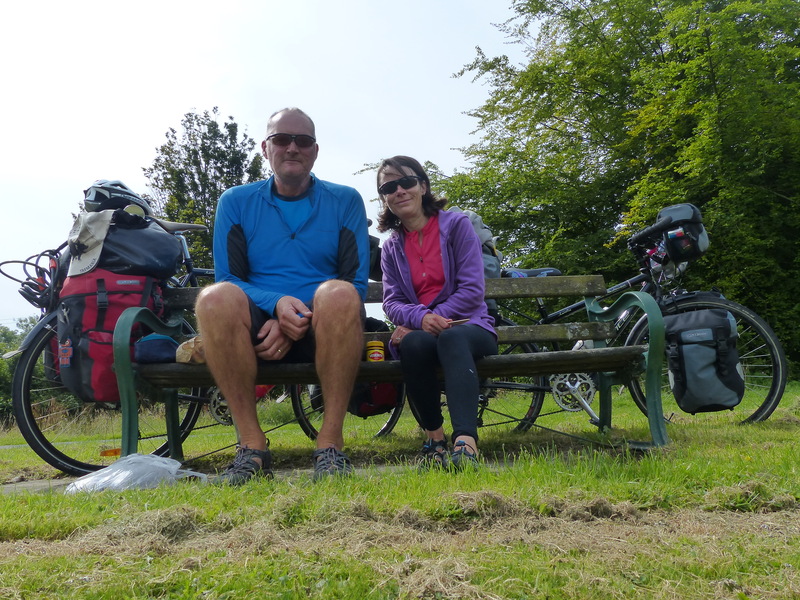 We decided we might as well have lunch before we left town, so Sainsbury’s supplied us with a nice selection of fruit and veg for me and bread for Steve and we sat in the park in the sun and had our cyclists’ picnic. It was very, very nice to have the sunshine again and to feel warm. Delightful. On we went, with our route now zigging north slightly, before zagging east. This zig-zagging was partly done so we could see some different places, but mainly in an effort to find campsites. We decided not to go all the way south to the coast at the moment, opting to dodge the crowds and penny arcades of Brighton and Eastbourne on a weekend, so we stayed inland and zig-zagged our way north-eastward and we’ll head south again in a few days, after the weekend’s added busyness is over. 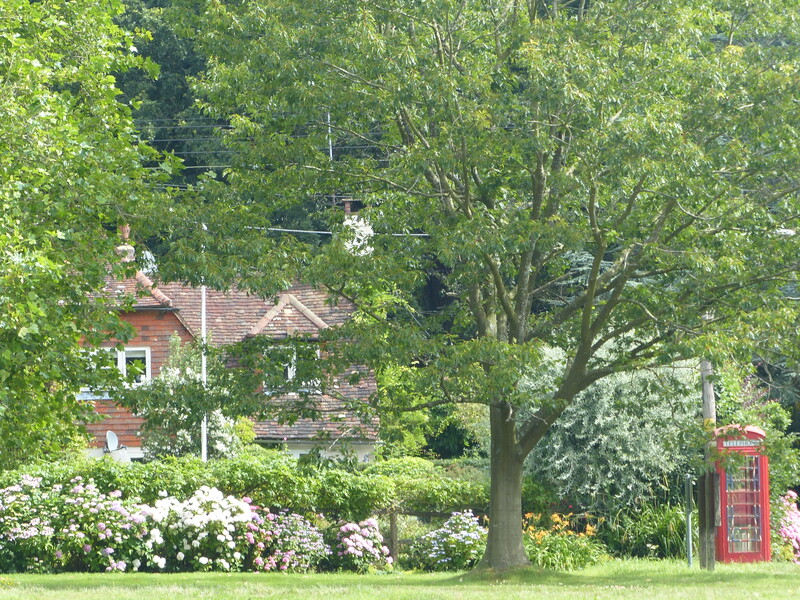 Our destination campsite, was in Lingfield, so off we went in that direction. Our route took us off-road in parts and at one point we were riding right beside Gatwick airport. RRRROOOOOOMMMMMM!!! came a roaring noise above us. 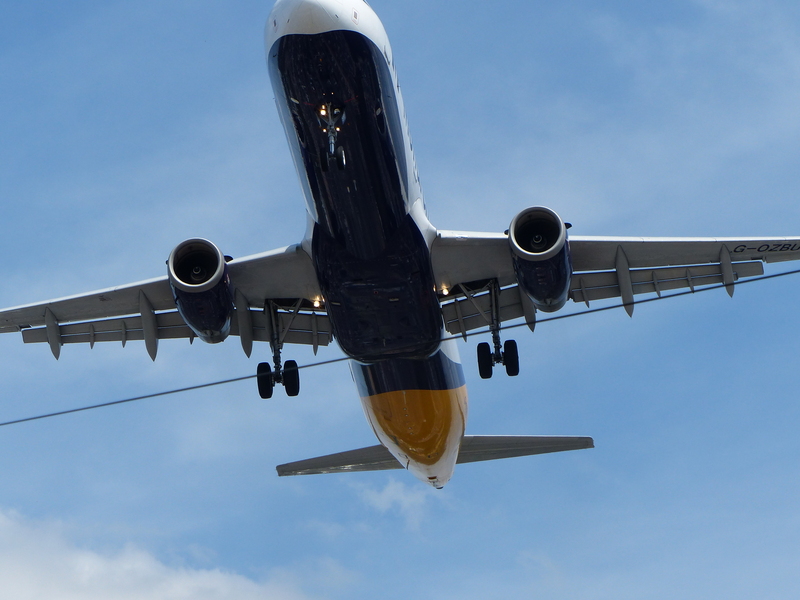 A plane was coming into land, right above our heads. We watched its belly fly over us and then use a crabbing technique, with the plane coming in at an angle to combat the cross-winds, then an elegant straightening of the nose, before the wheels kissed the ground. 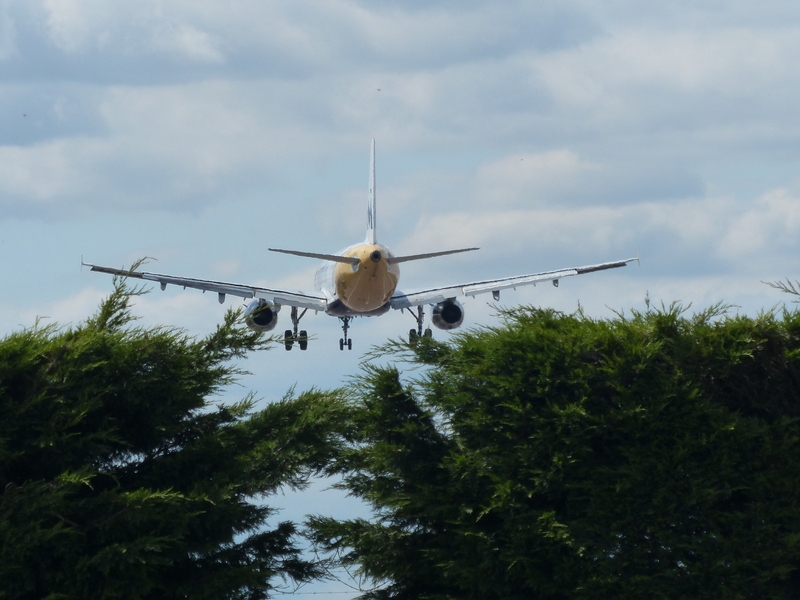 We stood as another plane approached and watched this one fly right over our heads, before expertly sailing over the fence and landing on the runway. It was great entertainment! 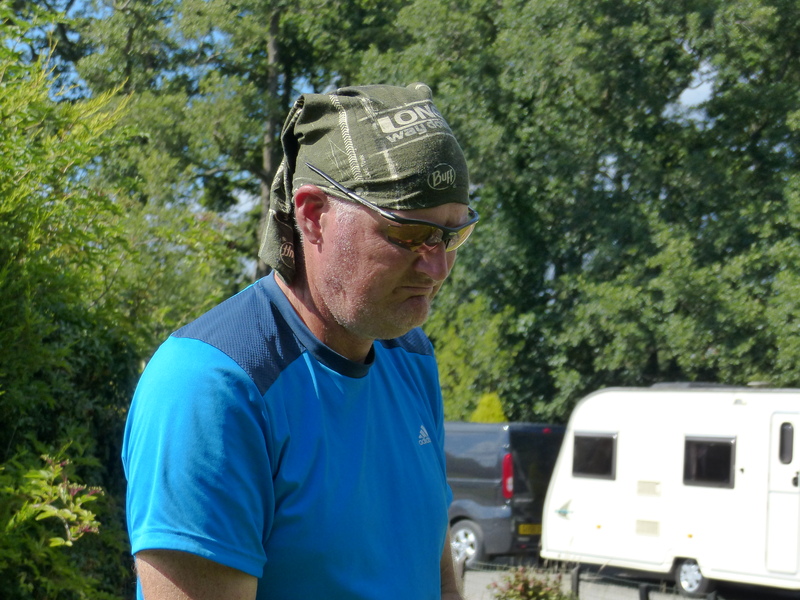 Our 53km ride eventually took us to our campsite, Longacres, and we checked in, located our pitch and I began firing up the Trangia to make our routine post-ride cuppa. It was at this point that we discovered that two unfortunate events had occurred. One was just a little unfortunate and the other one was quite sad. The unfortunate event was discovered as I went to hook up the new gas bottle to the Trangia. It didn’t look right and didn’t have a thread to attach it to the gas element. I called Steve over in case it was just my feeble brain showing its incompetence. “Oh No!” said Steve (I really don’t like it when he uses those words!) It turned out he had accidentally picked up the wrong type of gas bottle that needs a click-in attachment rather than a screw one like we have, so no gas for a cuppa. Thankfully though, we had some fall-back metho in the bottle, so we could still light our trusty little stove and we’ll go in search of new gas tomorrow. The second and sad discovery was made as Steve went to take his Tasmania cap off the back of his bike, where he attaches it each day by its velcro strap. “Oh no!” he said for the second time, “Tas!” The poor Tassie cap was gone. Nowhere to be seen and nowhere to be found. Lost. Gone. That cap has been with us and worn by Steve for the whole trip. Twice it has come undone and each time I was riding behind and managed to see it and stop and pick it up. I don’t know what happened today or where it could have fallen off because I didn’t see it drop. I guess it just wasn’t on tight enough and the velcro has come undone, so somewhere out there is a worn, scruffy but much loved Tasmania cap, with a Tasmanan Devil on it, lying in the Sussex countryside or roadside. Goodbye Tas, you will be missed. With the Tas cap gone, Steve had to resort to wearing his Buff, which I must admit, doesn’t have quite the look that the good ol’ cap had. We had a commiserating cuppa while the tent dried out from its wet beginnings this morning, then set up, before setting off again to ride into the village of Lingfield to find some supplies for supper. When we returned it was to find that our nice, wide space around us was now occupied by quite a few more tents and many more people. Darn! Peace has departed! 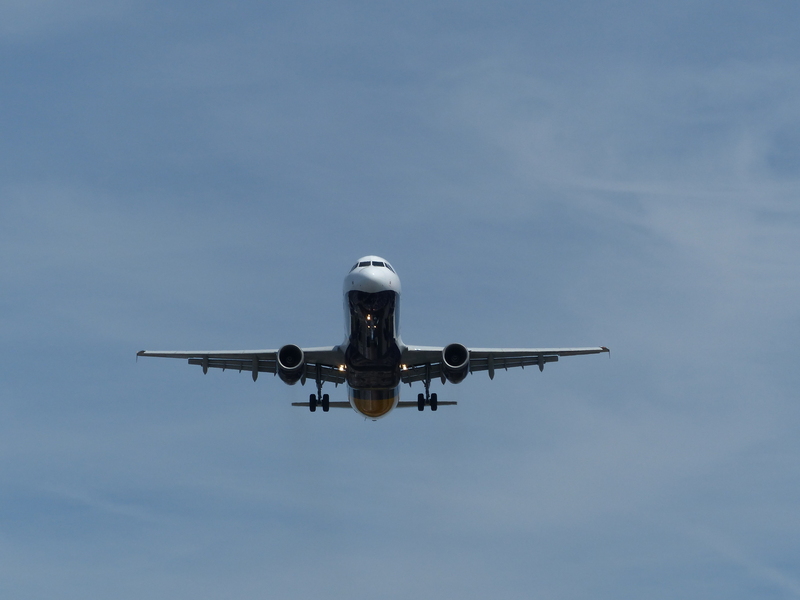 Now there’s lots of doof-doof music playing and that, accompanied by the overhead reminder that we are camped right under the flight path to Gatwick, makes for a less than tranquil home for the night! Oh well, it’s all good and we will not be crotchety old folks that complain about noise. We will just go with the flow! We’ll do a bit more zig-zagging tomorrow as we begin heading south again, in search of sights to see, villages to visit and campsites for camping. We are seeing England at its eclectic best as we go this way and that, up and down and around, seeing the cities, towns, villages, countryside, coastlines and along the way, meeting more wonderful, friendly and welcoming people. What a top place! Simply topping! Forward ho we go! Unbelievable! You’ll be dusting off all your New York winter clothes just to wear to Stella! And…I heard, snow in East devonport on two occasions today as well. As your trip around the UK nears its end, I’m wondering what country you’ll visit next. Scandinavia? Switzerland, Italy? So many to choose from! Fingers crossed for a few more warm days. Well, I hope the thermals are working for those in Tassie! We’re still deciding on where to next because we haven’t decided which ferry to catch yet, from Dover or further up at Harwich. So our next arrival in mainland Europe will either be France or Holland, then we’ll head south and chase the sun!